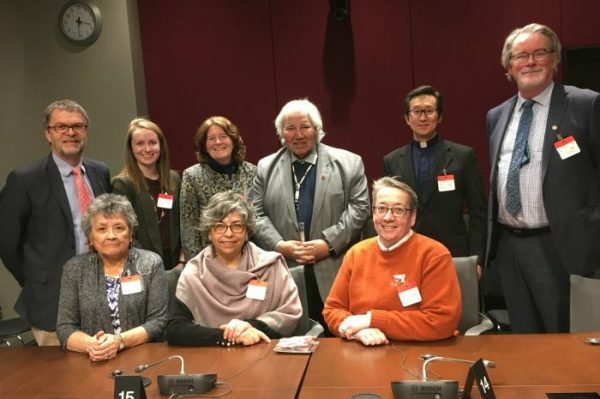 On March 19 and 20, representatives of the United, Presbyterian, and Anglican churches, Canadian Friends Service Committee and Mennonite Central Committee Canada visited with Canadian senators to discuss the urgent need to pass Bill C-262 (The United Nations Declaration on the Rights of Indigenous Peoples Act) on a non-partisan basis. Leaders were encouraged by support for the bill from non-aligned and Independent Senators. There is a clear sense among many that this bill could help provide clarity and an orderly process to develop a new relationship based on the principles of mutuality, equity, and respect—those longed-for ideals of the Royal Commission on Aboriginal Peoples that have yet to come to fruition. Others expressed the need to learn more about the bill before making a decision about support, or expressed concern that the Declaration’s inclusion of free, prior, and informed consent (FPIC) constitutes a de facto Indigenous veto on development projects. More information and other links will be found there. Bill C-262 has been passed in the House of Commons and now is at the second reading stage in the Senate. To read the proposed act, follow its progress, and read the speeches that have been made in both the House of Commons and the Senate go to the Parliament of Canada’s LEGISinfo site. The full title is “An Act to ensure that the laws of Canada are in harmony with the United Nations Declaration on the Rights of Indigenous Peoples“. This bill is one step towards following through with the Truth and Reconciliation Commission’s Calls to Action. A video on Bill C-262 featuring ELCIC National Bishop Susan Johnson, Anglican National Indigenous Bishop Mark MacDonald, and Dr. Beverly Jacobs provides information on the importance of passing this legislation. Free, prior, and informed consent (FPIC) is a piece of the United Nations Declaration on the Rights of Indigenous Peoples that presents difficulties for some. A factsheet produced by the Coalition for the Human Rights of Indigenous Peoples and endorsed by Amnesty International Canada, Assembly of First Nations, BC Assembly of First Nations, Canadian Friends Service Committee (Quakers), First Nations Summit, Grand Council of the Crees (Eeyou Istchee) / Cree Nation Government, KAIROS: Canadian Ecumenical Justice Initiatives, Native Women’s Association of Canada, Union of BC Indian Chiefs, and Dr. Mariam Wallet Aboubakrine (Expert Member, UN Permanent Forum on Indigenous Issues) helps explain what this means. All three of our denominations support Bill C-262. Both the Mennonite Central Committee and KAIROS: Canadian Ecumenical Justice Initiatives have developed a means for contacting senators to ask them to support Bill C-262.